One of my favorite things about fall is creating all the fun layered outfits. With the right basics, you can easily turn a few pieces into a month long wardrobe. To help you create such endless style, I’m sharing the 4 fall basics you need in your closet. 1 – Long Cardigans – Oh I own soooooo many long cardigans! I’m always cold, so I use that to justify how many I own and continue to buy. 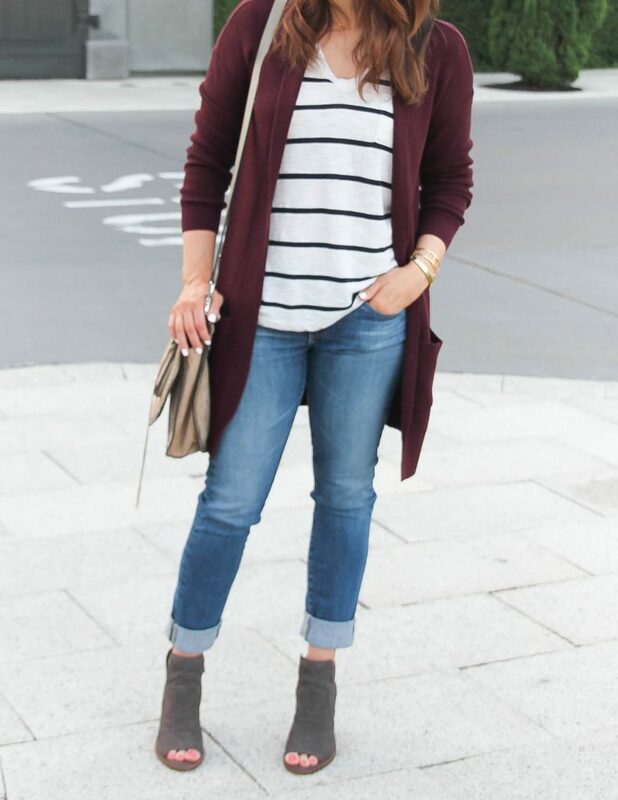 Cardigans are great to throw on over work outfits, dresses, and add on to any casual outfit. You can pair them with shorts during the transitional time of the season too. To make them even more versatile, go with basic colors like gray, black, and ivory. I also find good use in my burgundy ones. 2 – Basic Tees (especially striped tees) – For casual looks, a good basic tee is a great start to an outfit. I look for something semi-fitted, so it will lay properly underneath another layer like a cardigan or jacket. A fun trend is to layer your tee under sundresses or slip dresses to wear them into fall. Striped tees are key in my wardrobe. I pair them with a skirt for work or jeans for weekends. 3 – Classic Denim Styles – I think everyone needs a black and a blue pair of jeans. These two shades will take you far in terms of outfit creation and versatility. Black jeans give you an instant chic look plus black goes with everything! A medium blue jean color is perfect to wear year round, and it works well with mixing and matching. I prefer the skinny style. It’s cute with heels, long tops, tucks nicely into boots, or cuffs perfectly to pair with booties. A few extras – I love a darker blue pair in a bootcut or flared leg for when I want a more dressed up look. Lately, I’ve been loving my gray jeans. I find them to really work with a wide array of colors and prints. 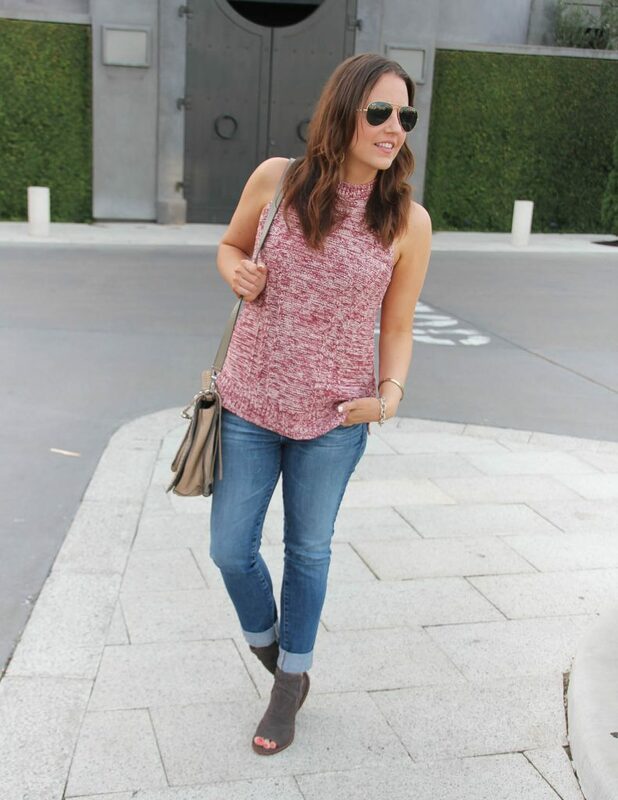 4 – Classic Bootie or Boot – The right style and color can work with so many casual outfits. If you can only get one pair, opt for a neutral color like taupe or beige. I find this color works with more colors and prints. I’m crushing on peep toe booties right now, because we didn’t really have a long winter last year. I wore my other pair so much which is why I chose to get one more pair this season. If you are looking for a new pair of booties, check out my best of the season round up HERE. BONUS – I was torn between which shoe style to include in my top 4, so honorable mention goes to a great flat. A pointy toe flat is great to wear both to work with business attire or on weekends with jeans. 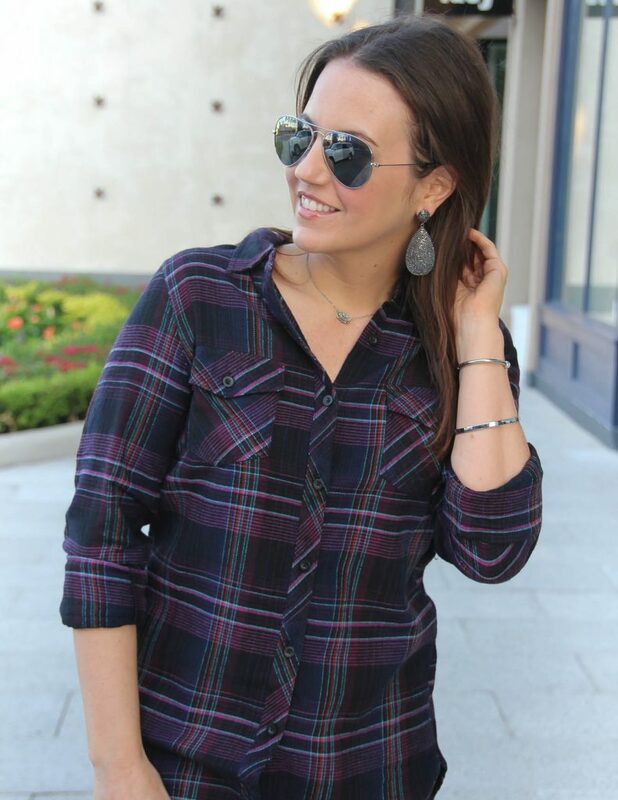 I’m so excited to share this purple and black plaid with ya’ll today! Awhile back, I posted a similar plaid (that really old post here) that I just loved and wore all the time. But it’s a much tighter fit then it used to be ;), and I really wanted to find a similar color scheme with a looser, comfier fit. This one is probably the most similar I have found with the black background and purple and white plaid design. It also has a hint of red. It’s a lightweight flannel material, so it’s going to be nice to wear in winter too. It’s the perfect plaid to replace my old fave. Since I love finding ways to dress up my casual items. I wanted to share a few ways I dress up plaid shirts. For starters, the easy option – add a chic heel. These black heels have been my ride or die for work since I purchased them. I wear them about 3 times a week, and they are still really comfy. Another idea for dressing up plaid is all about the accessories. I picked up these gunmetal statement earrings recently. 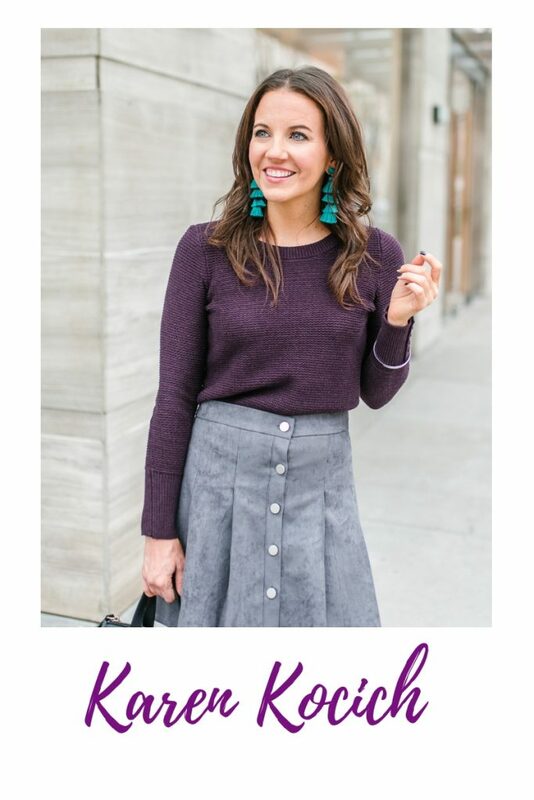 I had two style ideas in mind for them – 1) Dressing up a basic tee and 2) Holiday earrings!! Imagine them with a chic black sweater and black leggings for a Christmas party outfit. Cute, right?!?! I loved the way the gunmetal complimented this plaid. I think it gave the look a little more of an edgy and trendy vibe. Last, you can never go wrong with a great black pair of skinny jeans. Such a simple and easy way to instantly dress up and add chicness to any outfit. You may remember me mentioning these Hudson jeans during the Nordstrom Anniversary Sale. They were the pair I was waiting to come back in stock in my size. Well they did, and I’m in love. Ya’ll AG and Paige have been my go to denim brands, but this pair OMG so comfy for a skinny jean. I’m going to give them a few months of washing and wearing, but Hudson may be making it’s way on to my list of must own denim brands! Also, don’t forget it’s Style File Link Up day!! I can’t wait to see all the fabulous outfit inspiration! Scroll on down to check it out and bloggers feel free to share your latest outfit post! Thanks for reading ya’ll! Talking my favorite topic today – SHOES! In my last post, I discussed a little about items to transition your wardrobe from summer to fall. 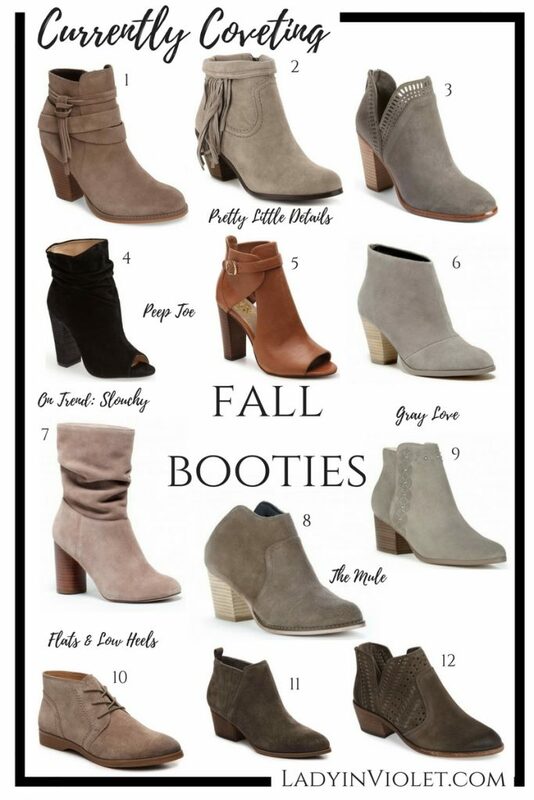 Booties are a great item not only to transition your wardrobe, but to continue wearing all fall and into winter. I headed to a few of my favorite shoe sites and found the best fall booties this season. I tend to always gravitate to the same color in my ankle boots. Obviously by my cute little graphic, you can tell I like a neutral shoe. 😉 If you spy a style you really like, most of these come in multiple color options from black to brown, some even burgundy and other fun colors. You can click the number below the graphic to see all the color options for each shoe. Booties this season come in all shapes and sizes and pretty little details. I love all the options this year! A few stand out trends I found were the color gray (major swoon over here! ), slouchy boots (this will be popular in tall boots too! ), peep toe booties, and the mule. The details on a bootie are a fun way to give your shoe a little wow factor, but I also found some simple pairs perfect for when you don’t want your shoes to steal the show. This year, I also made sure to find some super cute flat or low heel booties for those of you who are not so keen on being in a heel all day. I love the first one #10. I think it would be perfect with cuffed jeans or paired with a casual dress. Good news, most of these shoes come in under $100. A few pairs came in right under $150 which still is a decent price if you wear them as often as I do. Plus, I feel like the ones I picked even if trendy will be stylish for a few years, so you will get your money’s worth. Which bootie or bootie style is your favorite?? Happy Friday!! We had our first official fall cold front come in this week, and I even had to pull out a cardigan for work yesterday. I can’t believe we are having such cool weather this early in September! The cooler weather means it’s time to start transitioning my wardrobe to fall. Sleeveless sweaters and peep toe booties are two items I love to incorporate into my summer wardrobe and fall transitional outfit ideas. Both provide a little warmth for cooler morning and evenings, but you stay cool during the warmer parts of the day. I love the marled look of this sweater. It’s a great silhouette for work too! I paired it with a pair of maroon skinny pants a few weeks ago (SEEN HERE). The high neck is comfy too, not too tight or restricting at all! Ya’ll, I am loving these booties! I added a peep toe pair last fall and soon realized they were a great year round bootie for Texas weather. I have mentioned before (last seen in this post), these were an immediate add to cart during the Nordstrom Sale. They will definitely be finding their way into many outfits this season! I love that the peep toe portion helps your feet breath a little bit during the warmer parts of fall. Ya’ll have a great weekend! If you are in the path of Hurricane Irma, all of us here in Texas are sending all of our prayers your way! Stay safe!